The Echinothuriidae are a family of sea urchins in the order Echinothurioida. 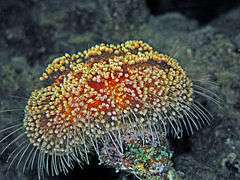 Due to their soft skeletons, most are called "leather urchins", but species in the genus Asthenosoma are also known as "fire urchins" due to their bright colors and painful, venomous sting. These sea urchins have a disc-like body, more or less bulging, structured by a flexible test, which is nearly unique among sea urchins. Most species can grow quite big and live in deep seas, though some genera contain shallow species (especially Asthenosoma). The test is composed of thin and weakly calcified plates, not always continuous. The spines are attached to perforated and uncrenulated tubercles. Spines from the oral face are ending with a hyaline hoof, which allows walking on soft substrate. The jaw (Aristotle's lantern) has five aulodont teeth. This family seems to have appeared at the end of the Cretaceous. "†" means an extinct taxon. 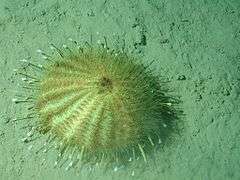 ↑ Mah, Christopher L. "What are the Deepest known echinoderms ?". The Echinoblog. 1 2 "Echinothuriidae". Echinoid Directory. ↑ Kroh, A. (2015), Echinothuriidae Thomson, 1872, In: Kroh, A. & Mooi, R. (2015) World Echinoidea Database.